Todd Mayo (5.3 PPG, 14.1 MPG) remained a non-factor after off-the-court issues plagued his freshman year. Coming off a summer-long suspension with an opportunity to split minutes with Trent Lockett and Blue, Mayo was instead declared academically ineligible and sat out the first 10 games of the year. Subsequently, he regressed statistically in nearly every facet and failed to score more than 13 points in a game after doing so five times as a freshman. Although Blue became a prolific scorer, he remained woefully inefficient from beyond the arc, shooting just 30.3%. That Blue led the team in made three-point shots (with only 40 buckets) reveals a major weakness in the Golden Eagles’ offense; Jamil Wilson was the only other player to make as many as 30 threes (at a 36% clip). 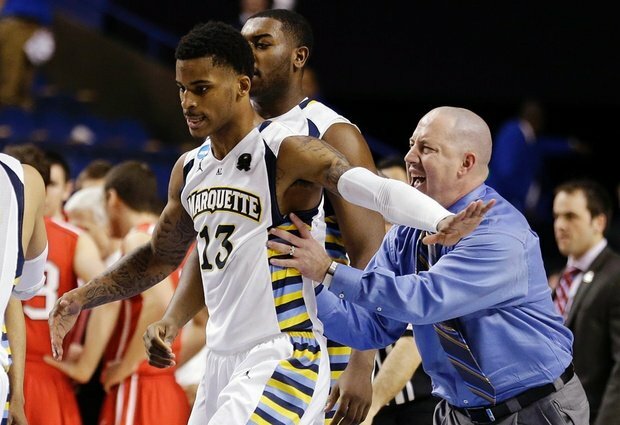 In the Elite Eight blowout loss to Syracuse and its suffocating 2-3 zone, Marquette went 3-of-25 (12%) from beyond the arc, as Blue, Wilson and Junior Cadougan shot a combined 2-of-18. Marquette’s prospects for next year fell victim to perhaps the most shocking of NBA early entries when Blue channeled God Shammgod and declared for the draft against virtually everyone’s advice. Lockett (7.0 PPG, 5.1 RPG) was a serviceable backcourt fill-in for Johnson-Odom this season, but his single year of eligibility is now up. The graduation of senior point guard Cadougan (8.5 PPG, 3.8 APG) leaves only two of this past year’s five leading scorers remaining on the roster in Gardner and Jamil Wilson (9.7 PPG, 4.9 RPG). Nevertheless, Marquette appears poised to reload with the best recruiting class of the Williams era, which Scout currently ranks #6 and tied for tops in the Big East (the Big East of yore, that is –– the one with Syracuse and the defending National Champions). Mayo will compete with highly-touted incoming freshmen JaJuan Johnson and Duane Wilson to replace Blue and Cadougan in an entirely overhauled backcourt. Williams filled his junior college quota with 6’8″ Iowa prospect Jameel McKay, who eschewed offers from Indiana, Memphis and others to come to Wisconsin and try to become the next Jae Crowder. McKay should complement Gardner and Jamil Wilson well, while physical four-star small forward Deonte Burton will take a spot right behind Wilson in what’s shaping up to be the most talented and deep frontcourt in the Catholicized Big East. Productive 6’11″ role player Chris Otule (5.1 PPG, 63.4 FG%), who suffers from glaucoma, has asked his school to formally petition the NCAA for a sixth year of eligibility on his behalf, and he is expected to receive it. This entry was posted on Tuesday, May 21st, 2013 at 11:01 am by Will Tucker	and is filed under big east, microsites. Tagged: buzz williams, chris otu, darius johnson-odom, Davante Gardner, deonte burton, duane wilson, Jae Crowder, jajuan johnson, Jameel McKay, jamil wilson, junior cadougan, marquette, todd mayo, trent lockett, vander blue. You can follow any responses to this entry through the RSS 2.0 feed. You can leave a response, or trackback from your own site.